My favorite conference of the year is the Skoll World Forum in Oxford. That’s still the case even after attending the Forum for eleven straight years as of last week! Why, after all these years, do I love going back? First and foremost, it’s the people. This is my posse, the global social entrepreneur community, as well as the people who appreciate and support them. Everybody there understands the issues at the intersection of social good and innovation at scale. That is why conversations at the Forum start where conversations elsewhere end. Thanks to the environment of trust and effectiveness, there are nearly one hundred people on my list of follow-ups from last week! The programming also works well for me and most of my fellow social entrepreneurs. That’s no accident: since its inception, the Skoll team has continuously improved the Forum. The event starts with two-and-a-half days of the Skoll Convening: a gathering of all of the current and former Skoll Awardees. This year’s Convening was the best one to date, and I’ve been to all of them. The cohort is really changing: a third of the Skoll Awardees’ organizations have gone through or are going through leadership transitions. Interestingly enough, the Skoll Award status tends to stick with the individual, albeit many Awardees are off starting another social enterprise (or two). There were also some successor CEOs in the crowd, along with an explicit track for senior colleagues (like Betsy Beaumon, Benetech’s new President), as the Skoll Foundation increasingly recognizes the importance of strong teams to their grantee organizations. It was also interesting to meet a new group of a dozen young leaders picked from among the Skoll network organizations. Many conversations about deep and meaningful topics took place during the Convening, in small and large groups. This is the part that really fed my heart. Our peers are grappling with many similar challenges around leading social sector organizations, and there is immense comfort in sharing these worries—and your experiences—with people you trust. I always walk away with new ideas from my fellow social entrepreneurs. Fellow Skoll Awardee Martin Burt and I gave a joint session on his Poverty Stoplight program (a methodology that allows poor families to assess their level of poverty across several dimensions and to develop a customized plan to overcome it), and on building software applications for collecting data from the people served by social enterprises. Our session was well attended and we received plenty of helpful feedback. One highlight of the Convening for me, though, was meeting the Dalai Lama’s personal physician and spending a couple of totally engaging hours with him. That’s a very “Skoll moment:” you never know whom you’ll end up sitting next to! The Convening is followed by a two-and-a-half-day conference with a thousand attendees, numerous sessions, and three daily inspirational plenaries. Other than the sessions where I was directly involved as a presenter, I spent almost all of my time in scheduled and impromptu meetings. Oh, and there are dinners (generally in Harry Potter-esque dining halls) and parties every night. These, in fact, are critical parts of the experience: connecting with old friends, setting up meetings for the next day, and (extensively) talking shop. Exhausting, but totally worthwhile. Those around-the-clock meetings were the mind food for me: completely inspirational for my work in the coming year. Just about everybody wanted to talk about how technology could play a major role in improving their ability to scale their impact. That includes a great number of terrific social entrepreneurs who have probably avoided engaging with technology for most of their lives. As one of the few geek social entrepreneurs, I’m a rare pipeline to Silicon Valley technology for my friends in the network. By hearing from dozens of CEOs and founders about their tech needs, I’ve been connecting the dots. I connect some groups that have similar needs and that should be talking together. Some organizations I can point to solutions that exist and are worth evaluating. Moreover, from Benetech’s standpoint, I get to spot projects that are candidates for Benetech Labs: needs that could turn into Benetech social enterprise products. I like the fact that the Forum welcomes promising, up-and-coming social entrepreneurs beyond the limited circle of established social entrepreneurs and the handful of new Skoll Awardees each year. I had the pleasure of meeting Ben Knight of Loomio, an exciting tech innovator from New Zealand who came out of the Occupy Movement to make a web solution for democratic decision-making that’s exploding in use around the world. One of my dreams ten years ago was to see more Benetech-style organizations launch, and meeting Ben was a thrill: seeing someone just a couple of years into that path and already having global impact! 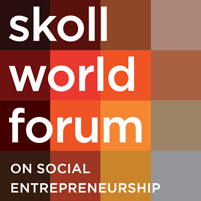 The Skoll World Forum has become the best global conference for social entrepreneurship, and the highlights I just shared are some of the reasons why I keep coming back to it. The Skoll team has pulled off critical mass in attendees, which makes it incredibly efficient for organizations like mine with a global focus. There’s no other place where I can have a hundred useful conversations in one week with people from Europe, Africa, Asia, Latin America, Oceania, and yes, North American and even California. Even though the Forum is heavily oversubscribed, I feel new social entrepreneurs doing great work can still get in and benefit from the peer support. That’s how we build the movement.